Commence ascent of West Ridge of Phipps Pk, from Temple Basin goods lift shed (highway 73). Once on the tussock covered slopes begin sidling the contour towards the Pegleg Ck catchment, rising where necessary to avoid multiple gullies. Descend the spur below the 1728 point, crossing Pegleg Ck’s Sth branch, and then continue sidling under the Sth Ridge of Mt Stuart to the basins directly below the summit. From here a series of steep snow/ scree covered slopes lead to the col south of the summit. Ascend the ridge opposite Goodluck Creek, reaching the knoll north of Phipps Pk (This is a bit of a bash!). 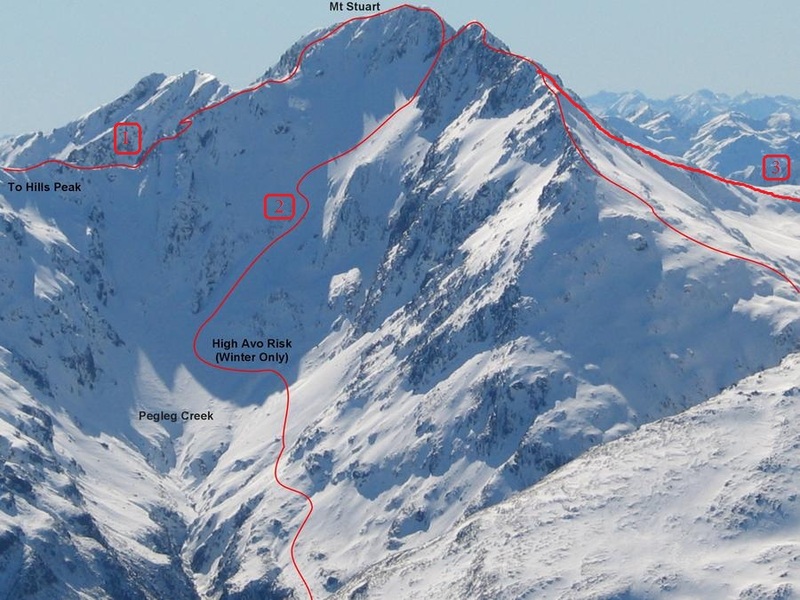 Traverse through the saddle and ridge to Mt Stuart.